You love to run, you love birds and here you have the chance to combine those two passions. Press A / D when marker is in green zone to increase pace. Click on bird to start investigate, keep hovering to improve speed of investigation. 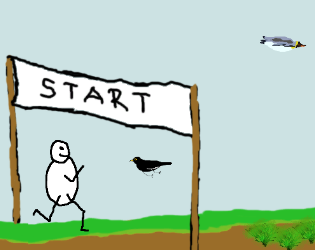 Run fast, run hard and identify as many birds as possible at the same time. Birding: Identify as many as possible. New species and species you have not identified many of give more points. Running: Run as fast as you can. Shortest time wins. Birding x Running: Basically your birding score per minutes your run took.